Respiratory rate or Breathing Frequency:The number of breathes taken in one minute. Dyspnea or Shortness of breath: Feelings associated with impaired breathing. Apnea: Temporary suspension of breathing. Orthopnea: Shortness of breath when lying flat. Platypnea: Shortness of breath in standing of sitting position. Paroxysmal Nocturnal Dyspnea: Attacks of severe shortness of breath and coughing that occur at night and awaken the patient. Frecuencia Respiratoria o Ventilatoria: El número de respiraciones tomadas en un minuto. Eupnea: Respiración normal, 12-20 rpm. Disnea: Sensación subjetiva de dificultad respiratoria. Apnea: Suspensión transitoria de la respiración. Hiperpnea: Aumento de la profundidad de la respiración. Hipopnea: Disminución del flujo aéreo. Ortopnea: Disnea en posición decúbito supino. Platipnea: Disnea en posición vertical o erecta. Disnea Paroxística Nocturna: Ataques de disnea que ocurren durante la nochey despiertan al paciente, forzándolo a tomar la posición ortopneica. 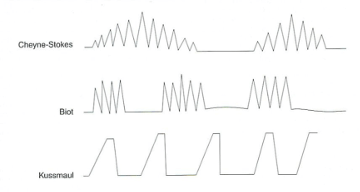 Cheyne-Stokes Respiration: There’s a gradual increase in the frequency and depth of breathing, which then gradually decreases until reaching a period of apnea. Biot’s Respiration: Groups of quick, shallow inspirations followed by regular or irregular periods of apnea. Kussmaul Respiration: Classic hyperpnea with a normal or slightly elevated respiratory rate. Respiración de Cheyne-Stokes: Hay un aumento gradual en la frecuencia y amplitud de las respiraciones, para luego disminuir hasta apnea. Respiración de Biot: Ventilación entrecortada, irregular, de amplitud variable y con periodos de apnea. 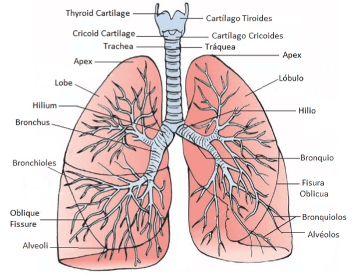 Respiración de Kussmaul: Clásica hiperpnea con una frecuencia respiratoria normal o un poco aumentada.